In 1924 Robert Schuman purchased the estate in Scy-Chazelles, a Lorraine village on the slopes of Mont St.Quentin that forms the backdrop to the area of Metz. Today the house has been transformed into a museum and convention centre. The buildings and the gardens are austere and yet simple integrating harmoniously into the landscape of the Moselle valley. Scy-Chazelles is of significance in terms of European memorials in that in honours one of the Father's of Europe. The location provides an ideal place for contemplation and many come here to do just that. Across the street lies the fortified 12th Century church where Robert Schuman now rests. 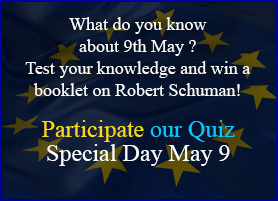 The Robert Schuman House for Europe organises cultural and educational events that initiate the visitor to the life and works of Robert Schuman himself, as well as the way Europe has been constructed and continues to develop today. The Robert Schuman House was one of the first sites to be labelled "European Heritage" in March 2007. On 9th January 2012 the Robert Schuman House in Scy-Chazelles received the "Illustrious Houses" label on the part of the French Communications and Culture Ministry. Androulla Vassiliou, European Commissioner for Education, Culture, Multilinguism, Youth and Sports visited the Robert Schuman House on 20th April 2012. Welcomed by Nathalie Griesbeck, Vice- President of the General Council of Moselle, Chair of the Social Affairs, School, University and Research Committee, General Councillor of the Canton of Metz III and MEP for the "Grand Est". On the agenda: laying of a wreath in the church of St Quentin on Robert Schuman's grave, visit of the house and the permanent exhibition in the museum.